Teagan Wylltson leads a busy life. She has an exciting job at a primate house, a supportive best friend, and a fantastic and supportive family. One day she comes home from work to find a cousin she didn't know existed would be moving in with them. But Finn brings more with him than just a troubled foster family history, he brings an entire fantasy world and attendant monstrous creatures. Hamilton has based her elaborate mythology on Irish faery lore, and she does a great job with integrating the mythology into the story. The sidhe that terrorize Teagan's family and wreak havoc on her life are terrifying and the tension doesn't let up often in this tale. When their father is kidnapped by the faeries, Teagan and her little brother Aidan must go with Finn into the evil faeries lair to save him. In the midst of turmoil we see a budding relationship between Teagan and Finn (who are not actually related) and a rekindled relationship with Finn's biological (and their mother's adoptive) grandmother Mamieo. This book has a little bit of everything, and while it doesn't focus as much on the romance as Wicked Lovely, is a great read-alike for people who like that brand of urban fantasy. The book suffers from a few lapses in timing/pacing and locale. People who don't live in the Chicagoland area would probably never notice how strange the covering of ground by this family seems. Chicago is a place of many diverse and distinct neighborhoods, and this book doesn't acknowledge that at all. The pacing also seemed off, this story takes place over the course of months maybe? But it feels like a day with disproportionate amounts of time spent on Teagan's time in the ape house. It was a great way to get to know Teagan and be introduced the the story, but then important parts of the actual story felt rushed and told more than shown. All in all this book is a promising beginning to another urban fantasy YA series. It's set apart by being lighter on the romance and heavier on the lore than many of the other series that seem to focus too much on eternal love and finding The One in a post-Twilight world. 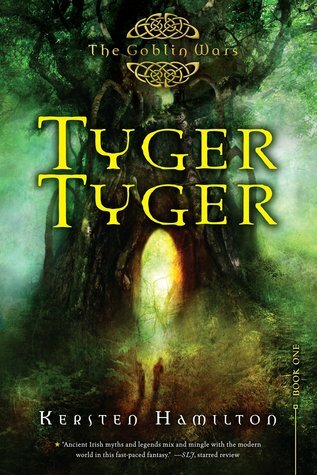 Sign into Goodreads to see if any of your friends have read Tyger Tyger.